Many of Sukhothai’s temples reveal origins of Thai art. Wat Si Sawai proudly stands about 350 meters from Sukhothai’s ritual center, Wat Mahathat. 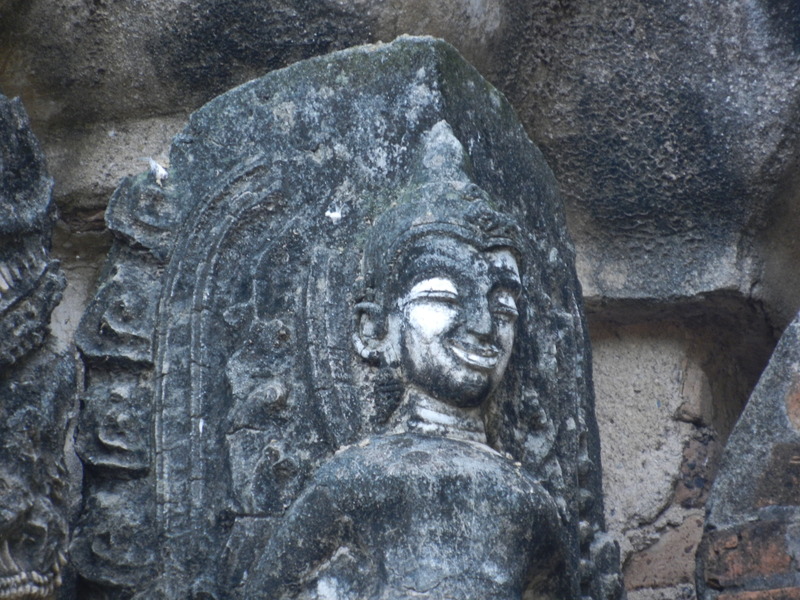 The Khmers originally built Wat Si Sawai in the late 12th or early 13th century as a Hindu temple–carvings of Vishnu have been found there. 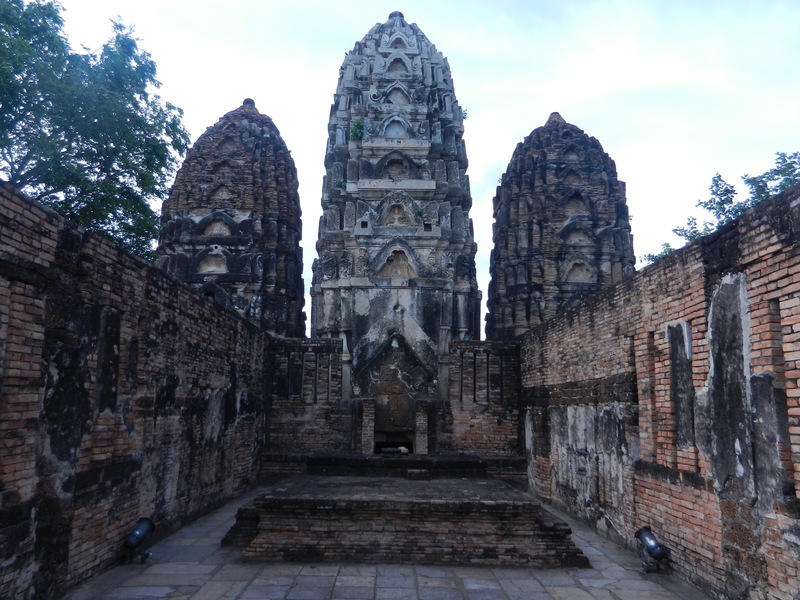 After Thais liberated themselves from the Khmers and founded Sukhothai in the mid 13th century, they converted Si Sawai into a Buddhist temple and transformed many of its features. 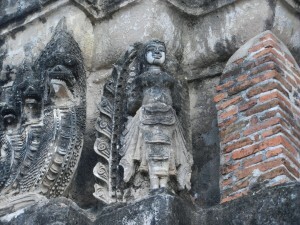 It’s a very pleasant place to explore because it shows Thai art emerging from earlier inspirations. 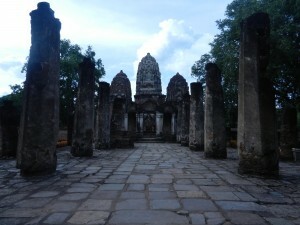 The temple’s entered from the south, and the Thais added a line of 2 assembly halls before the towers, and converted the central tower into a stupa. So people approaching the temple entered this stately columned hall. 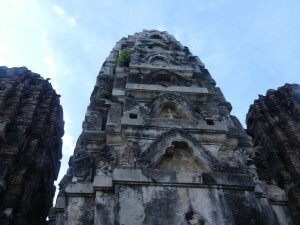 The Khmer towers no longer dominated Si Sawai. More ground space was devoted to halls where people assembled and paid respects. 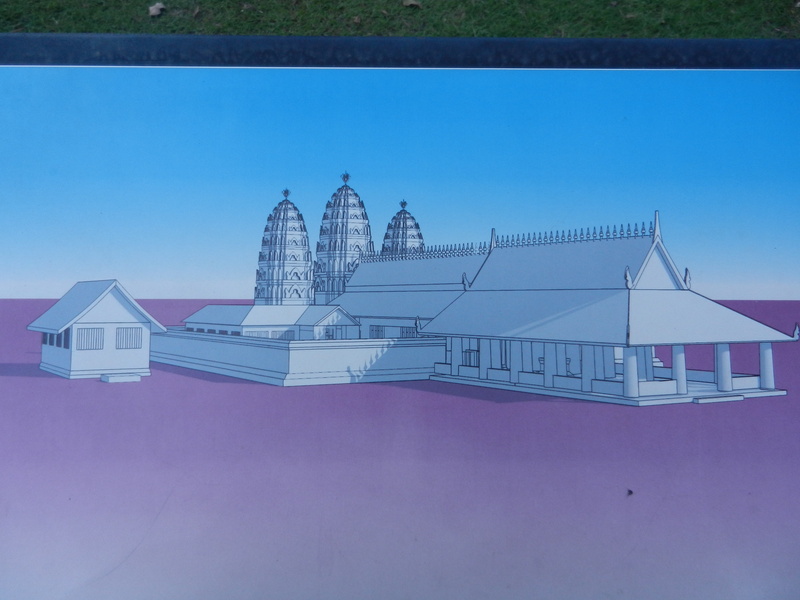 Thai temples give people a prominent place in the scheme of things. Here’s the inner assembly hall. 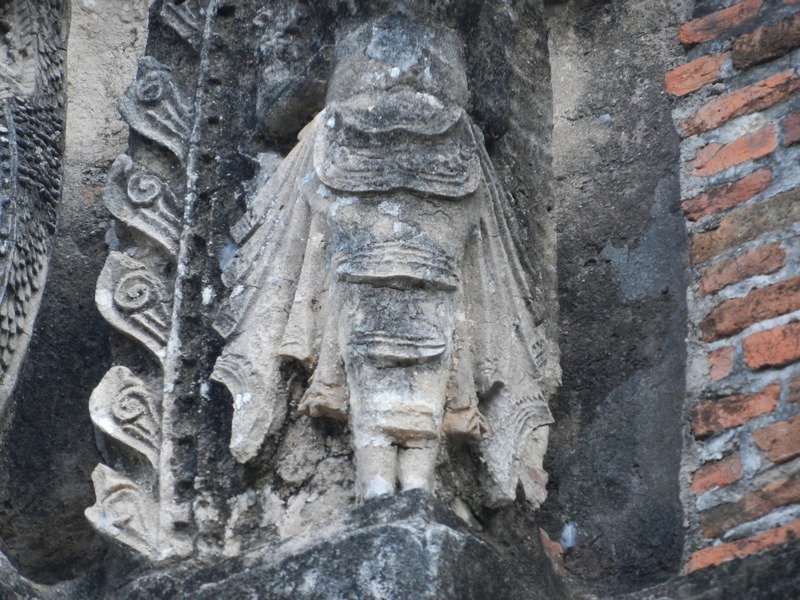 So a visitor would have walked through two dignified halls with handsome proportions before coming to the central towers–the experience of Si Sawai would have been softer than one dominated by the towers glaring under the sun. 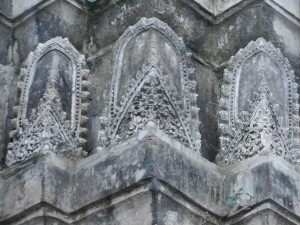 Thais also softened the central tower. 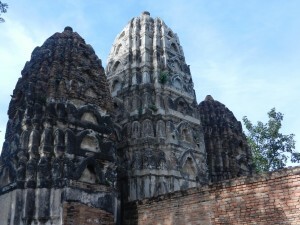 Carol Stratton, in The Art of Sukhothai, wrote that Thais built most of the 3 towers in brick and stucco on top of a lower storey which was made out of laterite. 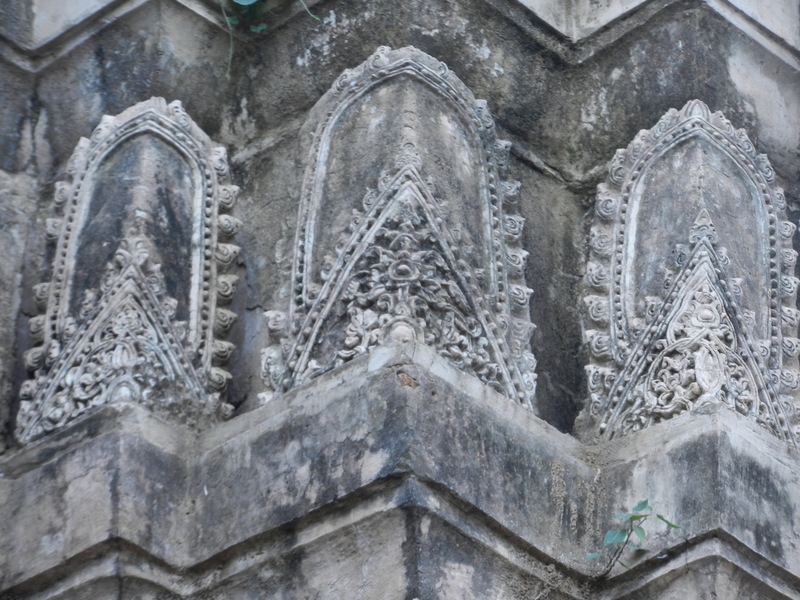 They emblazoned the stupa with graceful stuccoed forms. 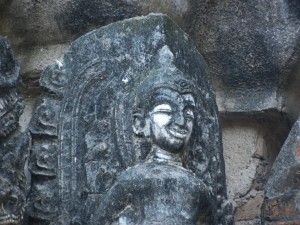 Though this deva’s chin and right cheek look partially reconstructed, the rest of the face, and the upper body, curve as gently as Sukhothai Buddha statues. 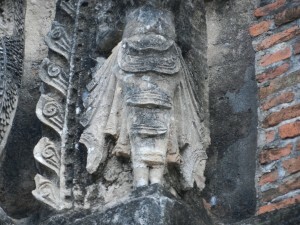 the clothing flows in equally elegant patterns. So do these abstract designs. So Wat Si Sawai began life when the Khmers dominated the Sukhothai area. When the Thai kingdom emerged, it was transformed into a Thai work of art. No single form imposes on the others. All blend into a flowing and tolerant landscape that reflects the Buddha’s compassion and Thai grace.